diversified explorer CanAlaska Uranium has announced its drill plans for its JV West McArthur project located in the Athabasca Basin. 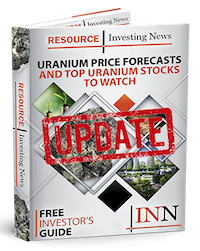 diversified explorer CanAlaska Uranium (TSXV:CVV) has announced its drill plans for the West McArthur project located in the Athabasca Basin. Under the joint venture with Cameco (TSX:CCO), CanAlaska will act as operator and plans to drill 7000 metres in 10 drill holes this summer to endeavor to intersect lenses of higher-grade uranium mineralization. In August 2017, Cameco intersected the first high grade uranium mineralized intervals on the northern portion of the five kilometre long Grid 5 target area at the West McArthur uranium project. The project extends over 36,000 hectares and the eastern boundary is 6 kilometres (4 miles) northwest of Cameco’s majority-owned McArthur River uranium mine and associated infrastructure. the east, the C10 conductor hosts the Cameco/Orano Fox Lake high grade uranium deposit. southward, 1,600 metres west of the property boundary.